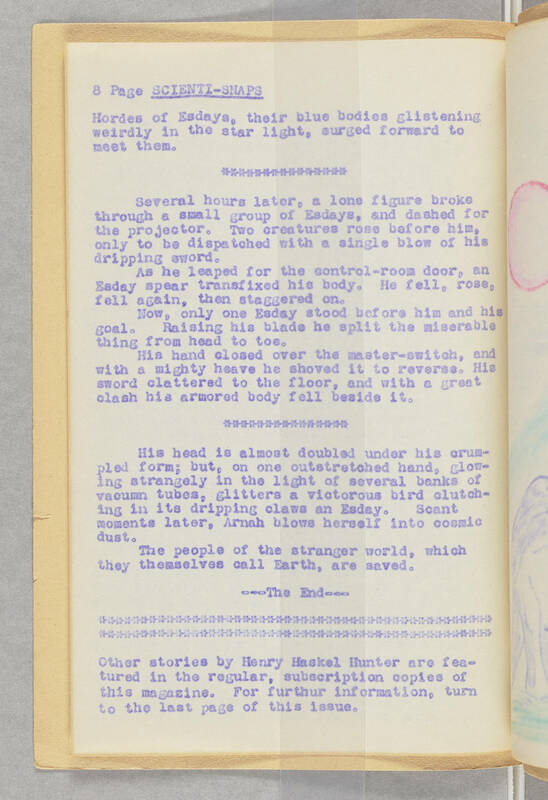 8 Page SCIENTI-SNAPS Hordes of Esdays, their blue bodies glistening weirdly in the star light, surged forward to meet them. Several hours later, a lone figure broke through a small group of Esdays, and dashed for the projector. Two creatures rose before him, only to be dispatched with a single blow of his dripping sword. As he leaped for the control-room door, an Esday spear transfixed his body. He fell, rose, fell again, then staggered on. Now, only one Esday stood before him and his goal. Raising his blade he split the miserable thing from head to toe. His hand closed over the master-switch, and with a mighty heave he shoved it to reverse. His sword clattered to the floor, and with a great clash his armored body fell beside it. His head is almost doubled under his crumpled form; but, on one outstretched hand, glowing strangely in the light of several banks of vacuum tubes, glitters a victorious bird clutching in its dripping claws an Esday. Scant moments later, Arnah blows herself into cosmic dust. The people of the stranger world, which they themselves call Earth, are saved. ---The End---- Other stories by Henry Haskel Hunter are featured in the regular, subscription copies of this magazine. For further information, turn to the last page of this issue.